January 26, 2004. There are important fatigue details on the Home page, together with any current news and information on this subject. This Webpage Reviews the Fatigue Details as experienced on the early models of the Boeing 747 (100s). In the early to mid 1980's, a serious metal cracking problems had become very apparent in the early Boeing 747's, which had not been anticipated in the original design of the airplane. The FAA was informed and it subsequently ordered Boeing to prepare a work program to correct these metal fatigue problems. A comprehensive study was undertaken by Boeing, each Boeing 747 was reviewed, and an appropriate repair program was prepared. The task was daunting. Boeing is the manufacturer of the Boeing 747 and does not maintain any repair facilities of its own. Like GMC or Ford with their cars, Boeing only sells original equipment has no facilities for in house repairs. Boeing's after sales function is to provide technical advise, work with the FAA and provide spare parts. The repairs to its planes are normally conducted by the airlines themselves or the planes are serviced by third party, approved repair facilities many of which can be located all over the world. Repairing most parts of the Boeing 747 is a relatively simple task but to repair the frames, webs and skin in Section 41 is a major problem. Section 41 of a Boeing 747 accounts for about forty percent of the cost since all of the controls, navigation and other functions are located in this first section. There are simply miles of wires, pipes and other controlling parts beginning in Section 41 and going to every part of the plane. There are instrument panels on the walls, the passenger seats are up front, in the upper cabin together with the service bays all of which makes it very expensive to see the supporting structure for cracks and other telltale failure problems such as corrosion. Many potentially dangerous cracks are so fine they cannot be seen with the naked eye. To bring in the X-ray equipment would be extremely expensive and most airlines cannot, or will not, afford such investigations. This is a picture taken from a book which shows Section 41 and 42 being lifted from the bay where it was constructed over to the main assembly line where it will be married to the main cabin. The front section of this Boeing 747 is in green and is called Section 41. The section immediately behind this is Section 42. This picture shows Section 42 being lowered into position to be joined to the main fuselage. This technique of manufacturing sections and joining them together like a huge Lego set is quite normal for the industry. Curiously enough the break up of Pan Am 103 occurred at the joint between Section 41 and Section 42 while in the TWA 800 case Section 41 broke away and took part of Section 42 with it as you can see below in this animation photograph which I pulled of the Internet. The official story would have you believe that the central fuel tank exploded near Section 42. 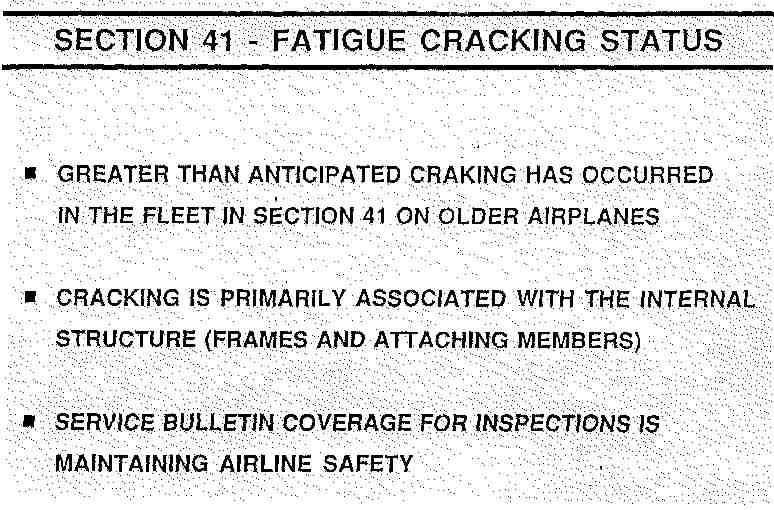 However, in the NTSB hearing document it states that Section 41 broke away and took part of Section 42 with it. The CIA animation is wrong but interesting. 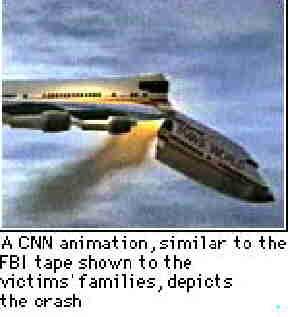 This is the picture I lifted from the CNN/FBI/CIA explanation of what happened to TWA 800. It appears that the separation occurred where Section 42 is married to the main cabin. However, the main debris field shows Section 41 closest to JFK airport (except the nose wheel door which was closer to JFK) while the main debris field was scattered further away as the main cabin tried to continue to fly. The official version is that the front third of the plane was blown off by the blast in the central fuel tank. However, if you read the official report it states that Section 41 came off first and took with it a piece of section 42! Quite different! At 550 MPH the air pressure on the main cabin would simply tear it to pieces. Forget the explosion in the central fuel tank. The fuel in the central fuel tank caught fire when the front section, Section 41, broke away. There is an excellent webpage, which has been created by Commander William S. Donaldson at www.twa800.com . This is a very interesting site because it clearly demonstrates that jet fuel does not readily explode. The central fuel tank explosion theory is bogus and everyone who understands this chemistry knows the facts. Interestingly enough a Washington, DC based organization called, Accuracy in Media is funding this investigation and producing a documentary to these facts. Let's hope AIM investigates the entire scope of these lies. Check out the details at this excellent website. www.aim.org . 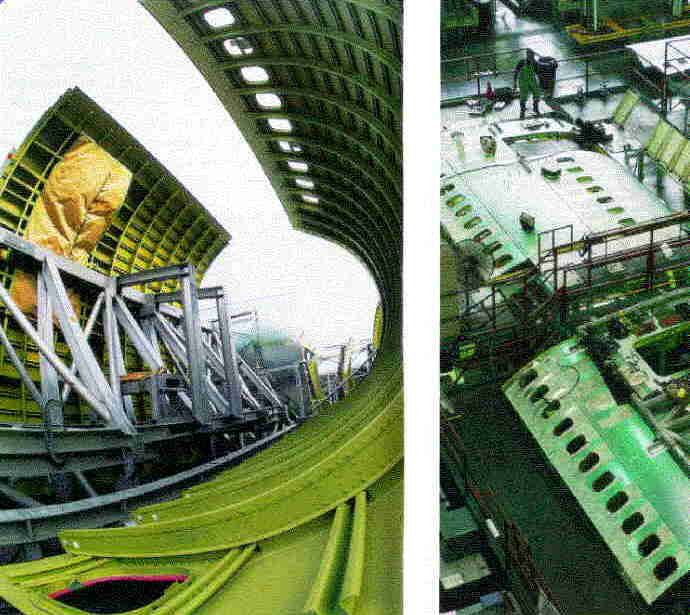 In the right hand picture you can see the skin of the Boeing 747 Section 42 being manufactured on a jig to ensure that it meets the designers exact specifications. 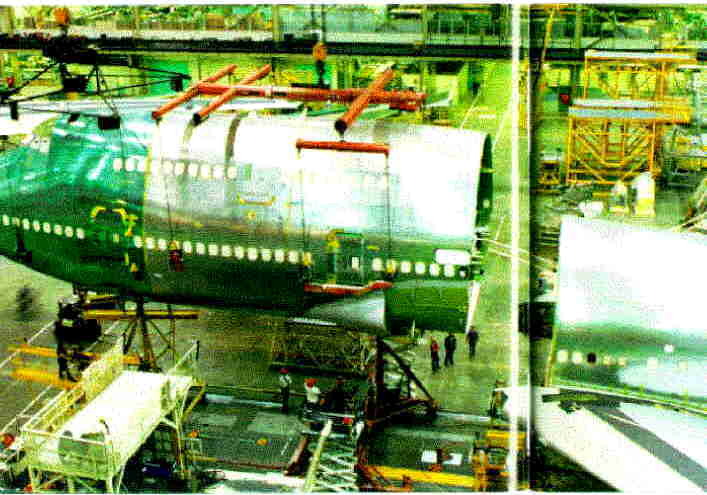 On the left hand picture you can see the various sections coming together to form the familiar shape of the body of the plane. Again, one has seen the pictures of the pieces of these planes from the crash sites and each time the fuselage, once the nose has dropped off, appears to split along the lines of these connections. If the metal parts do not meet the manufacturer's specifications, particularly the connecting bolts, rivets etc then metal failure will be inevitable. For more details review the other webpages at this site. 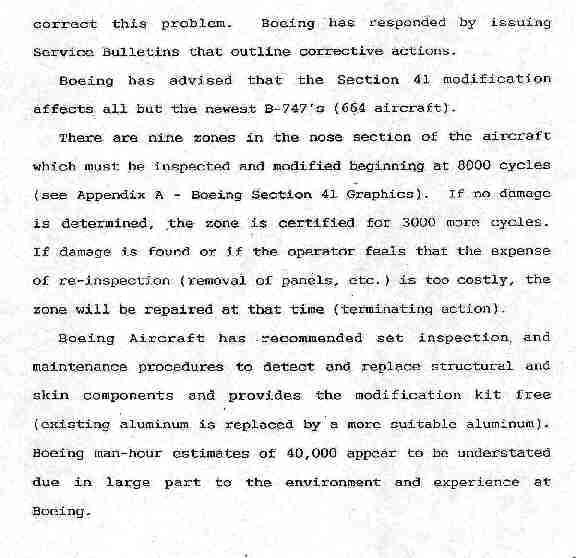 You are invited to read what a Boeing employee had to say to the Canadian RCMP about the cracking problems with the earlier Boeing 747's. Go to Air India 182's page above. Air India 182 . Aluminum Stress Fracture and Fatigue Related Incidences. As you can see from this picture which, has taken from the Internet, a large section of the roof came off this Boeing 737-200 beginning just aft of the equivalent Section 41 on the Boeing 747. It is a miracle that the plane did not totally disintegrate with the loss of everyone on board. 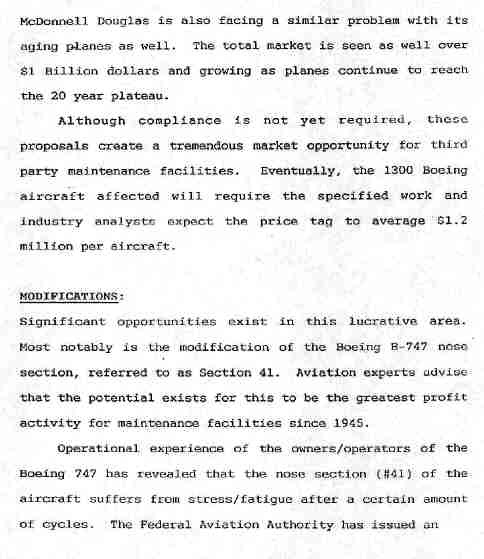 Repairs to the Boeing 737's is also included in the same business plan plan but will not be included on this Webpage at this time. The author wishes to emphasis only the Boeing 747 problems at this time. There are several important points that need to be addressed. The outside skin of all planes is relatively thin by design but its strength is more than adequate if the plane stays intact. If any part of the outside skin, frames or webs fail it overloads the rest of the skin which can lead to total failure. In the Aloha case the strength of the floor and the underside of the plane was strong enough to keep the plane flying for the short time it took to land the plane. One reason, I believe, why this plane did not disintegrate like the Boeing 747 is due to the fact that the oncoming air stream cleared the broken section. Had the oncoming air flow hit the cabin it would have torn the plane to pieces. When the plane landed the nose was three lower than it should have been; the survivors of this incident were extremely lucky. You should note that most planes have a circular cross section whereas the Boeing 747 has an oval cross-section of the fuselage in sections 41 and 42 which places high stresses on the skin, ribs and frames. For a more detailed description you must read the book where these stresses are discussed in far greater detail. 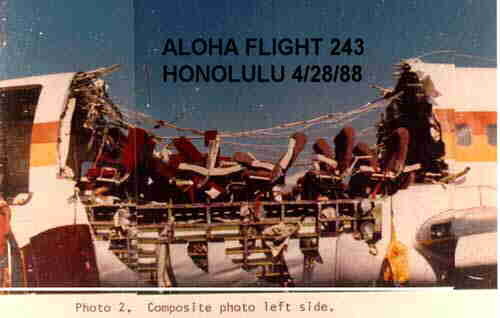 If you would like to read more about the Aloha Airlines 737-200 accident then please find the full story at http://www.aloha.net/~icarus/ . Image 1. Waiting on data Image 2. Waiting on data. Image 3. Waiting on data Image 4. Waiting on data. Image 5. This picture was taken from the report and shows the problems. Image 6. 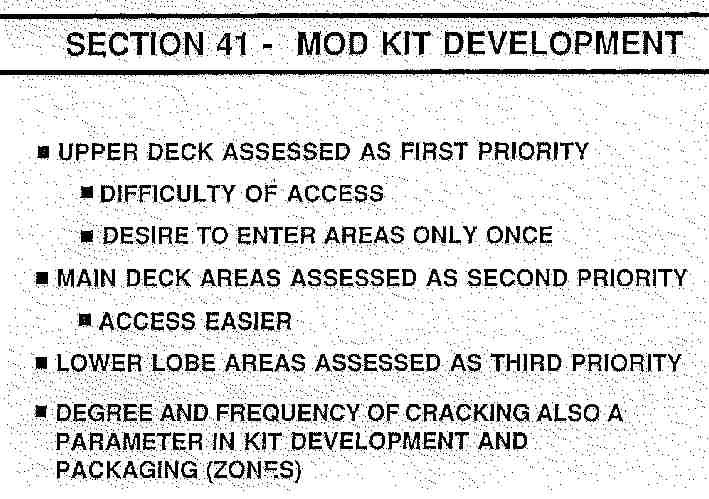 Another page from the report showing the modification requirements and the potential cost of this work. i.e. Profit to the repair facility. Image 7. Shows the fatigue cracking status. Image 8. Shows how to deal with the kit modifications. Image 9. Please note the date of the Alerts for Pan Am 103. Image 10. Read about the termination action required. Image No 11. 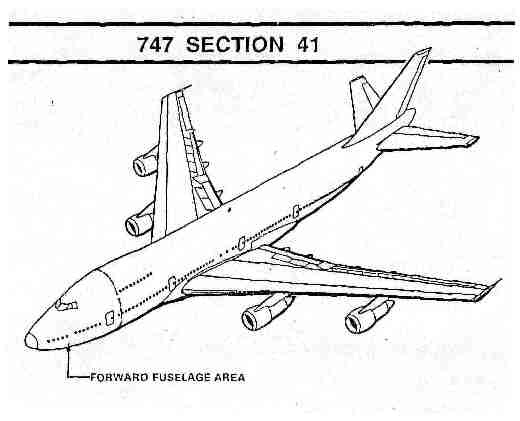 Schematic of the Boeing 747 showing Section 41 where the main cracks are occurring. This was provided by Boeing. Image 12. This is a schematic of the Boeing 747 ribs. Image 13. Composite of web and frame cracks. Image 14. Shows ribbing and floor structures. Image 15, Flange, web and stringer cracks. Image 16. Shows possible cracking areas at 8,000 cycles. Image 17. Shows possible cracking areas at 10,000 cycles. Image 18. Shows possible cracking areas at 13,000 cycles. Image 19. Shows possible cracking areas at 16,000 cycles. Image 20. Shows possible cracking areas at 19,000 cycles. Image No 21. Modification status. Note Pan Am 103, Line number 15. Zones 1 &2 modified only. Image No 22. Modification status Note TWA 800 Line number 153. Note Parts to be ORDERED in March 1, 1996. Plane went down on July 17, 1996. Image 23. Air India 182. No mods suggested as plane was relatively low on cycles. Image No 24. Modification status. Note that the Boeing 747's after line no 686 were constructed as "redesigned." More details will be entered at a later date; as time permits.